Custom machined billet steel tie rod adjuster sleeves & premium 'Problem Solver' Moog tie rod ends. Tie rod sleeves are made from billet steel, zinc plated for corrosion protection. Feature 11/16-18 LH & RH threads for easy toe adjustment. Wrench flat on sleeve to aid in precise adjustment. 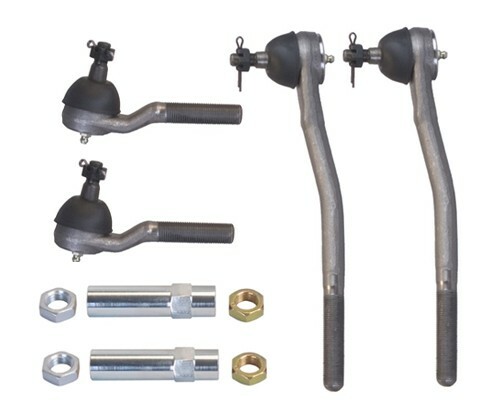 Kits feature premium 'Problem Solver' Moog inner and outer tie rod ends. Don't be fooled by cheap tie rod ends that will start rattling within a few hundred miles. Buy the good stuff and spend your time enjoying driving instead of replacing parts. Fits 65-66 manual steer & 67-73 manual/power steer V8 Mustangs. Please select carefully from the options below. If you have any questions what may fit your vehicle please let us know.